So, the subject of my favorite rpg-related podcast (Gamerstable, if you didn’t already know) today was damage, something that has been argued about most likely since the day after Dungeons & Dragons was first published. Look, the way D&D does it is fine. Is it realistic? No. But it works within the context of their system. Sure, they’ve tweaked it here and there over the years, but it essentially boils down to you have hit points until you don’t. Then you’re dead or unconscious or whatever. I’m okay with it and in most campaigns that how I roll, fairly straight up how the designers envision it. I do have a homebrew tweak I came up with back in the late 80s that I prefer, and it’s pretty simple. The gist of it is this: whatever your first level hit points are (plus bonuses) is your true health. When you take damage to your core health points, that’s actual physical damage to your fleshy bits. As you go up in levels and your hit points rise, those extra hit points are stamina. You recover them fairly quickly. Core points heal much slower, because thems some bumps, bruises, scrapes, cuts, and what have you. To me, that makes the most sense, at least in D&D terms. Your move base might vary. The Oak Hill Dungeons & Dragons Club got its start in 1978. There was a Converse Branch, a Sweetser Branch, and a Swayzee Branch… sort of. There was a lot of cross-pollination going on, especially once people started getting their driver’s licenses. So here we are, nearly 37 years later, and we’re still slinging dice. We’re coming up on the third anniversary of our reunion game, which was held at Ali-Caters on January 4, 2013. Shaun Keenan and I had talked on facebook about getting the old gang back together for a one off D&D Reunion game. Shaun got the venue donated, we sent out invitations, and I created a bunch of player characters loosely based on the personalities of our old friends. Obviously, we had a blast. And the best part is, we had so much fun, we’ve played every month since, sometimes twice. Of our regular players, Steve comes down from Chicago, Shaun treks over from Marion, Joe hails from Somerset , while Doug, my son Connor, and I are just blocks away from our “clubhouse”, the Old I.O.O.F. Building in Converse. This past weekend was a special treat. Mike flew in from Louisiana to play and took part in the early session with Conn, Steve, and myself and then tabled up with the ‘oldtimers’ once Shaun and Doug joined us for the late night game. As an added bonus, the Saturday Night game saw John back at the table with us as well. He, along with his daughter Abby, made the journey up from Indy to take part in what proved to be a spectacular, action-filled night we won’t soon forget. We have been at this a long time, and it looks like we’re in it to the grave. As I said in my last “DUAT” blog entry, D&D is a social game, it’s about friends coming together to tell a story. For a few short hours every month I get to take part in something magical, with lifelong compatriots and my son to boot. We’re hoping to put out another call and bring in some of the rest of the old gang, one more ‘reunion game’ with some of the old guard. Who knows, maybe some of them will become monthly regulars too. Well, this was never much of a secret back in the early days of the hobby. When my friends and I started playing in the late 70s, we didn’t have a lot of money. We bought what we could afford: the core books, a few modules, a Dragon magazine now and then, but certainly not everything that TSR produced. I mean, good luck finding it anyway. There was a Used Bookstore that carried D&D stuff about 20 minutes away, but they didn’t carry everything, just the essentials. The bookstores in the mall weren’t much better. We had to make due with what we had, which meant we made a lot of it up as we went along, and we had a blast doing so. I don’t know, maybe I’m getting old, but gamers today seem to want everything spelled out for them. Across social media, from reddit to twitter to facebook and beyond, I read post after post of hobbyists bellyaching about this product not being converted to this edition, or the lack of modules for one game and the glut of material for another, and on and on, this incessant whining about every little thing. Whatever happened to creativity? What happened to improvisation? What happened to immersive roleplaying and having a good time? What happened to seat-of-your-pants, winging it for the freaking joy of it? The camaraderie? Give me a handful of dice and something to write on and we’ll have ourselves a bloody game. Hell, to be honest, we don’t even need the dice. Dungeons & Dragons (or Pathfinder, Dungeon World, Shadowrun, 13th Age, etc ad nauseum) should be about one freaking thing and one thing only — telling an epic, rip-snorting, gods be damned story with your friends. You don’t need 236 splatbooks to do that. You need the basics. That’s all. Anything else beyond that is just ancillary garnishment. Slinging mud at Dungeons & Dragons because they’ve only released a Starter Set, three Core Books, a DM Screen, and a couple of hardcover Plot Books in two years is ridiculous, especially when the same people chastise the company for the free download supplements available via their website. I’m no Wizards of the Coast/Hasbro apologist. They’ve made mistakes, but taking the time to slow launch 5th Edition is not one of them. One move I do question is yesterday’s announcement that Wizards of the Coast will be deleting their forums in late October. 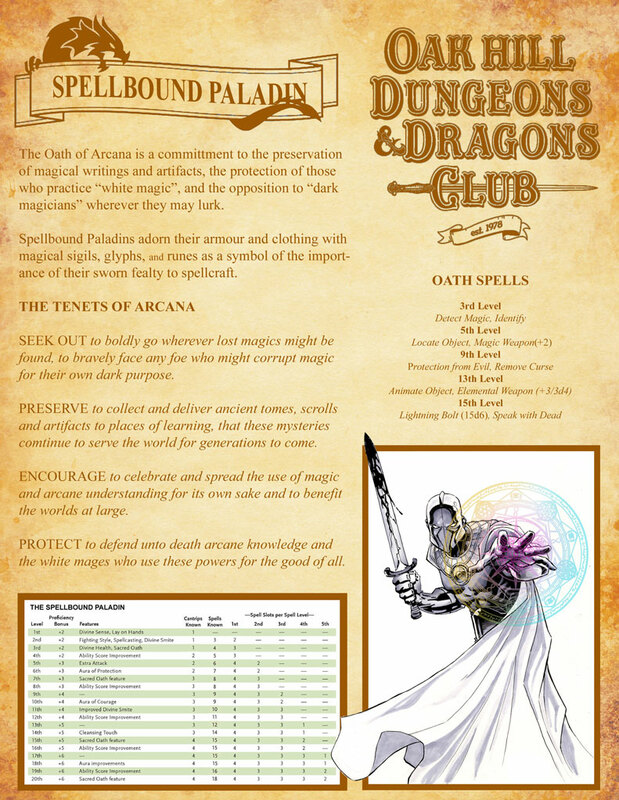 Dungeons & Dragons by its very definition is a social game. For the company that produces it to not maintain an official watering hole seems like a bad idea to me. Granted, there are plenty of forums out there that cater to rpgs, like enworld and giants in the playground, but if it were me, I’d want someplace for players to gather a little closer to home. But that’s a bit off topic and I’m starting to ramble. I will end with this simple thought, let your imagination be your rulebook and the source of your next rpg adventure. It’s pretty much how I’ve rolled for more than 30 years. It has never steered me wrong in all that time. Feed your head, free your mind, and spin a bloody yarn… and let the dice fall where they may. 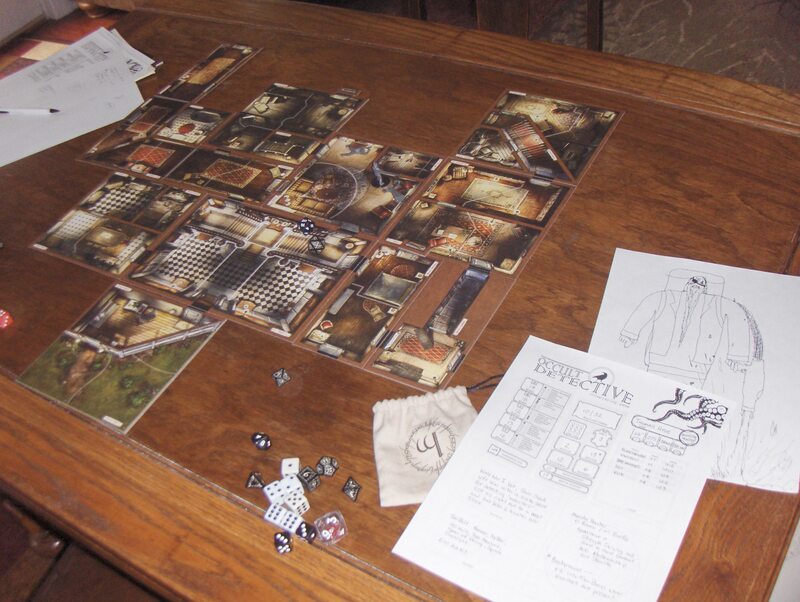 Utilizing Mansions of Madness tiles and various other cobbled together pieces from a sundry of board and roleplaying games, Connor and I took the Occult Detective RPG for a spin yesterday. I think the experience can be best summed up by my wife’s reaction when she came home and walked in on us mid-game. Well, the answer, my dear, is simple, we were having a blast. Granted, some of the unique mechanics I’d dreamed up never came into play which means they didn’t get playtested. That’s a bad thing. But for an overall gaming experience, it felt like an awesome hybrid of some of my favorite RPGs with some board game elements that already has me rethinking the overall direction I want to take this in. I’m trying to pull off a board game that plays like an RPG. Or is it an RPG that plays like a board game? Darn it, now I’m confused. No matter, the right sentiment is in play. What last night’s game session proved to me is that I’m on the right track. Sure, it’s back to the drawing board, but that’s where I’d rather be anyway. 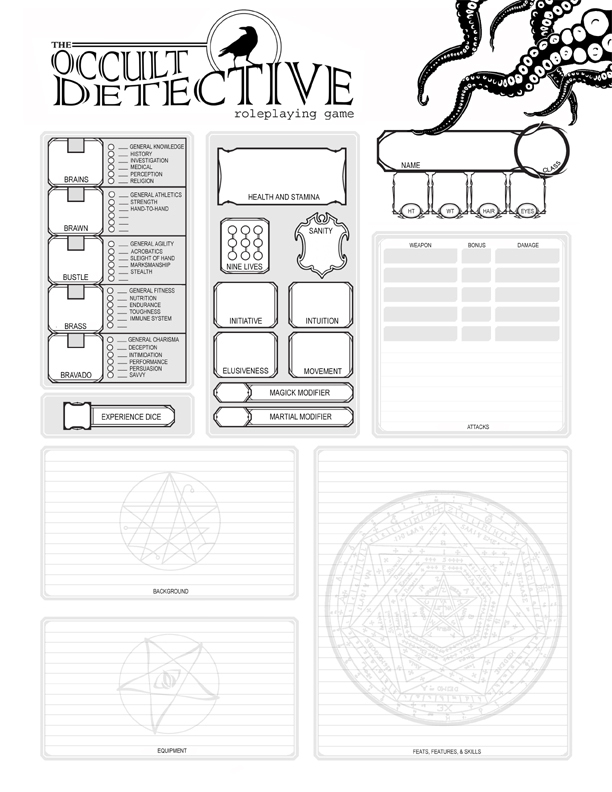 Here is the Character Record Sheet we’re using tonight for our first real test drive of the Occult Detective Roleplaying Game that I’ve been working at, off and on, for the past couple of years. It is still very much a work in progress, but we’re getting somewhere with it. Tonight will be a big test to see if some of these mechanics work or not. I have been a DM since 1978. I have navigated every iteration of the game so far, from original flavor to extra spicy. Some editions were more successful than others, but to be honest I enjoyed them all from a storytelling point of view because that’s what Dungeons & Dragons, and all roleplaying games for that matter, is to me: a vehicle for telling stories. I am not now and I never have been big on rules and table lawyers annoy the living hell out of me. I am more than happy to make a snap judgement call rather than crack the book to divine some obscure rule on cover or perform some sort of calculus to determine if you get a bonus reaction when the moon is in conjunction with Tempus’ outhouse. Rules-Lite, baby. That’s the way we rolled back in the seventies, when Led Zeppelin still ruled the air, and that’s the way I like to keep it rolling (and yes, Led Zeppelin is still in heavy rotation in my DVD carousel). That’s why, ultimately, I preferred Basic and Advanced over 3rd, 3.5, & 4th Editions. That was some rules heavy slogging going on. It weighed the stories down. It made every action a grueling act of attrition. It ground narrative flow to a halt. It is also why I have wholeheartedly embraced 5th Edition D&D. Granted, it helped that, coincidentally, we were putting the band back together just as playtesting began on 5E. The Oak Hill Dungeons & Dragons Club had a reunion game, originally intended as a one-off, that quickly became a monthly event. We dusted off our old AD&D Manuals and took our polyhedrons out of storage, but talk immediately began circuiting the table about making an edition leap. Some were keen on 3.5 and embracing Pathfinder. Others wanted to stick with the old tried and true from ye olden days. I encouraged we give 5th Edition a shot. I took part in the Wizards of the Coast Playtest and liked what I saw. A year later, we were all in. 5th Edition has been, pretty much, what I want from a game. It’s flexible and as simple or complicated as you want to make it, which is perfect for me. This edition has put story first and that’s the way I like it. Granted, they’re so story-driven that it’s pretty much their entire focus. Me? I’m not a module guy. I like to write my own stories, not tell someone else’s. 5th Edition gives me that freedom. I can ignore the Dragon Culting, Elemental Templing, Demon Raging or give it my own spin. It’s my call. 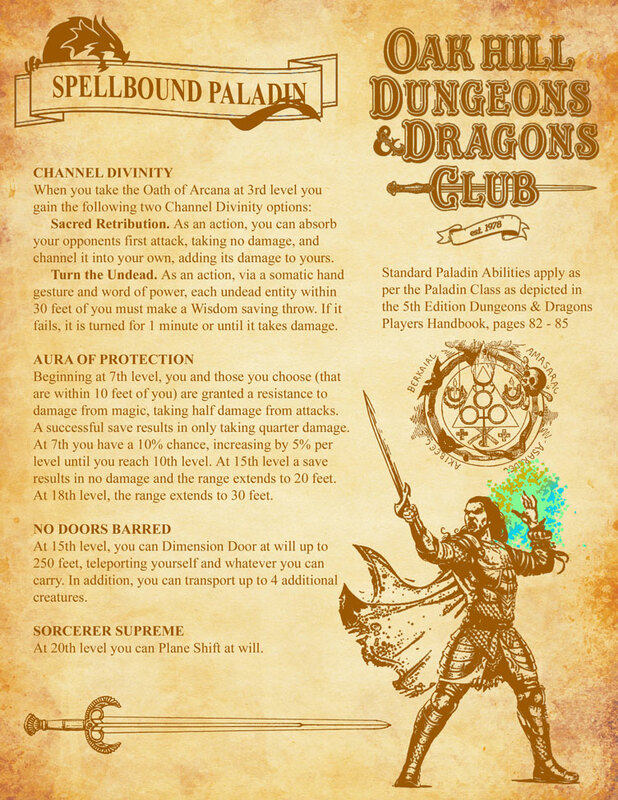 It’s tailor-made for a seat-of-your-pants DM.